* Bookings are essential as spaces are limited and subject to availability. A supplement of $15 per person directly to operator at time of booking. By the time you reach Huonville you'll already be captivated by the beauty of the Huon River, but now is your chance to take to its water. 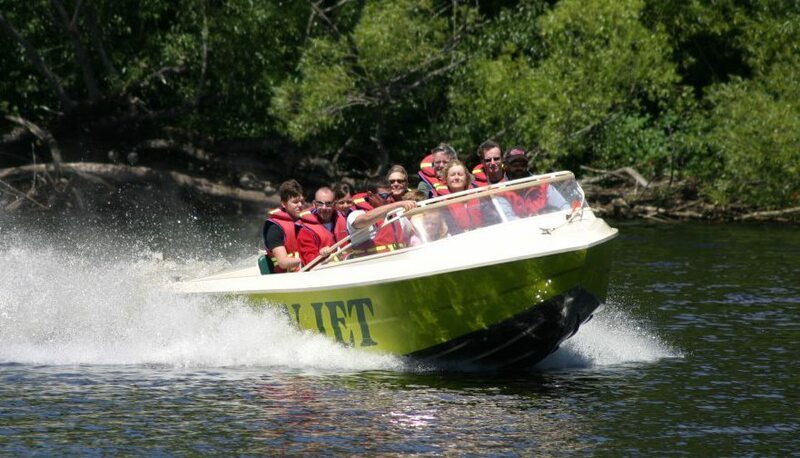 Be refreshed by the exhilaration of a shallow whitewater jet boat ride as well as the stunning scenery, history and economic diversity of one of Tasmania’s mightiest rivers. Experience the peace and quiet of drifting beneath Huon Pines then give way to the thrill of breath-taking 360 degree turns. Life Jackets will be provided; however, you will need to bring your own warm clothing and sunglasses to keep the wind out of your eyes. Departures are from the Visitor Centre which also has a picturesque café and offers access to other waterborne activities. Huan Jet is located 35 minutes south of Hobart. In order to get there, take the A6 to Huanville before turning left at the Bridge. Huon Jet is located another 500 metres on the riverbank of the Tamar River.